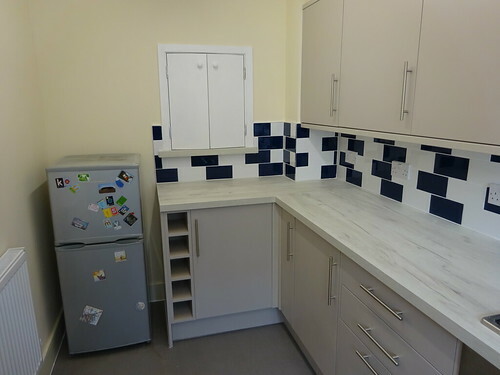 One or two people asked to see the finished result of my kitchen refit, so in that spirit (since the skip has now gone, and only a new fridge remains on the to-do list), here are a couple of pictures. I'm still sorting out what goes where, but that's a nice problem to have. 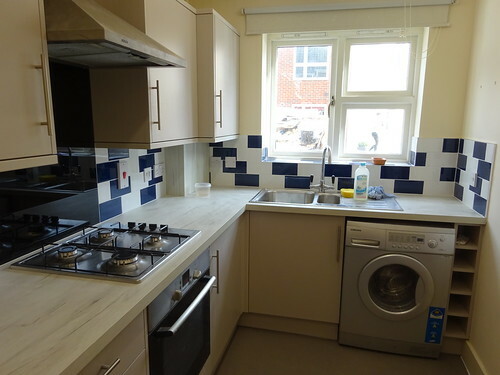 It's still not a super-fancy kitchen, as you can see, but at least it is now bigger than the outside of a TARDIS. The serving hatch is so that I can chat to my imaginary guests while I'm cooking. Oh, that is quite handsome! I like it better than my kitchen.